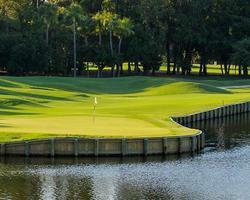 STAY AND PLAY ONLY - Rate only available when also booking lodging at Sea Pines Resort. Measuring 6,973 yards from the Heritage tees with a slope of 146, the par-71 course is deceptively short by today's standards. But numbers tell only a small part of the story. Like the old Scottish courses of which it is reminiscent, Harbour Town Golf Links requires perfectly positioned shots, arrow-straight accuracy and unwavering consistency on the part of the player. Its tight fairways, postage-stamp greens, deep bunkers and thick rough are just a few of the challenges. The layout is a complete reconstruction and recreation of the resort's historic Ocean Course, the first built on Hilton Head. Davis Love III and lead architect Scot Sherman have fashioned entirely rebuilt holes to accommodate modern shot values and frame scenic corridors. 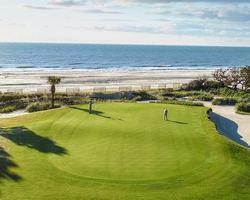 Atlantic Dunes features a pronounced seaside ambience and Lowcountry feel accented by coquina shells and seaside grasses. The project's goal was to incorporate elements of the surrounding beachfront along with the area's bounty of native pines and oaks lining the fairways. The course will benefit both visually and strategically from restoration of natural sand dunes as well as the creation of new dunes blending seamlessly into the design. Tens of thousands of indigenous plants have been installed in these areas to complete the seaside feel. Atlantic Dunes playing surface is a blend of cutting-edge grasses matching the superior strains at the resort's acclaimed Harbour Town Golf Links and Heron Point by Pete Dye. 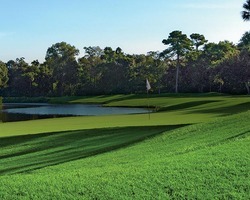 After a multi-million dollar reconstruction project, The Sea Pines Resort is pleased to announce Heron Point by Pete Dye. Designed by legendary course architect Pete Dye, Heron Point is nothing short of a modern masterpiece. Fairways have been reshaped into dramatic angles and shifting elevations, while surfaces are a mix of sand, mulch, limestone, and different grasses that offer a kaleidoscope of appealing color changes. 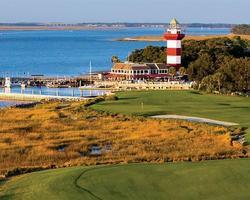 As the second Hilton Head Island golf course at The Sea Pines Resort designed by Dye, Heron Point lives up to its prestigious reputation with challenging new features.